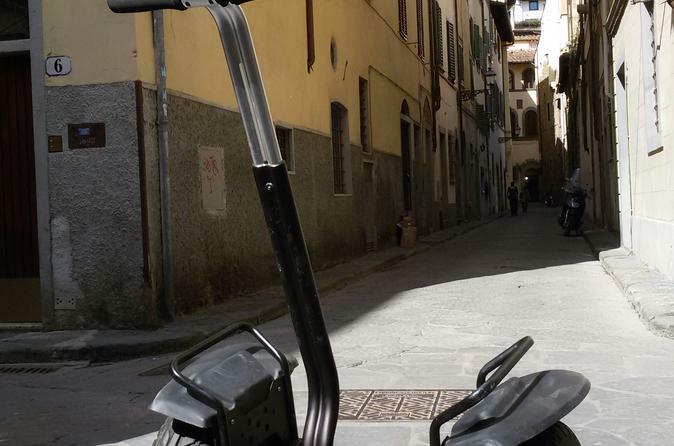 Explore the historic center of Florence in a fun way that doesn't wear you out with this private guided Segway tour. Meet your private guide in the Piazza della Signoria in the heart of historic Florence. Before departing, admire the Neptune fountain, the statues on display in the Loggia (including Perseus holding Medusa's head, cast in bronze), and a copy of Michelangelo's 'David' standing in front of the Palazzo Vecchio. Travel into what's known as the Dante District, the area of the city where the great poet once lived, to reach the busy piazza in front of the Duomo, the Cathedral of Santa Maria del Fiore. Take in the grand architectural statements made by the trio of buildings in the square – the church, baptistery, and bell tower – all decorated with multi-colored marble. Hear about how the Duomo was begun in 1296, but that it wasn't until 1436 that Filippo Brunelleschi designed the signature dome. Continue on to the Piazza della Repubblica, which was the site of the ancient Roman forum in the city and later a bustling market. Pay a visit to the Loggia del Porcellino and see the famous Ponte Vecchio, lined with goldsmith workshops. Follow the route of the Vasari Corridor to once again return to the Piazza della Signoria to conclude the tour.